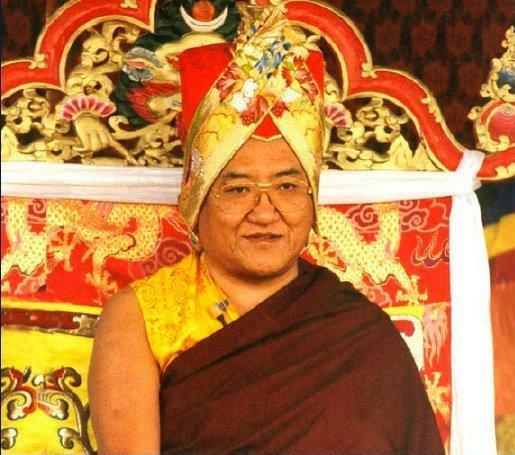 During his 1995 world tour, which took in Europe, the USA, Russia and Mongolia, he was hosted in London by Sogyal Rinpoche and Rigpa, where he kindly accepted to give the following interview to View magazine. Could you please speak about the Three Wisdoms–the wisdom of listening and hearing, the wisdom of contemplation and the wisdom of meditation (aka the three wisdom tools)–and explain how the traditional spiritual training for developing them differs from the modern approach to education? Whether people are believers or non-believers and whatever religion they follow, one thing that is common to all parts of the world, and to all races and traditions, is that people wish to be free from suffering and to be happy. In this respect I don’t see much difference between East and West or ancient and modern, because it is always the case that in order to have real happiness we have to have wisdom. Without wisdom–although happiness might be your goal–whatever you do, you only end up creating more suffering for yourself, whereas by developing wisdom you come to know exactly what the causes of suffering are so you can eliminate them and experience real, lasting happiness. For anyone who wishes to follow the spiritual path, the Buddhist teachings explain the importance of the Three Wisdoms. The very first thing someone entering the path and seeking the truth must be able to do is to hear and to learn. An experienced teacher begins by explaining to you the very basic Buddhist view: all compound things are impermanent, all impure things bring suffering, all phenomena are empty of inherent existence, and Nirvana is peace (see Four Seals). After hearing this, you personally examine how it corresponds to your daily life. Of course, even without listening to Buddhist teachings we can see for ourselves that everything in life is impermanent, but if someone tells you, this it helps you develop the strength of that inner understanding. This is what we call the wisdom you obtain from hearing. Next you go through the meaning of the teachings analytically and examine it very carefully in relation to your life and to the outside world. In this way you discover for yourself the truth of what your teacher said, and this enhances your inner understanding even more. This is the wisdom obtained through contemplation. On the basis of these two wisdoms, you begin to practise meditation itself, further awakening and deepening your inner experience and understanding. This is the wisdom that one obtains through meditation. Modern education trains us to listen on an intellectual level, so many people find the process of relating the teachings to themselves quite difficult to apply. You have to have an intellectual understanding first, otherwise you cannot develop a deeper understanding. I think we could say that the wisdom gained through hearing and study is intellectual. And then, from this basis, the wisdom you obtain through contemplation and meditation is deeper. I think there is nothing wrong with Westerners beginning with an intellectual understanding. Isn’t intellectual education an advantage if it gives us greater intelligence to understand the teachings? Yes. In the teachings we talk about two types of people, those who are intelligent and those who “follow through faith”. The intelligent person is actually in a better position because he or she does not accept whatever the teacher says at face value, but examines it first. The Buddha himself said that we should examine his words as we examine gold, and only when we are satisfied they are true do we take them to heart. It is with our intellect that we examine the teachings. Once we realise their truth, then our understanding is more stable than if we believe through faith alone. Of course both approaches have their advantages, but I believe an intellectual understanding provides a more stable foundation. In the traditional teachings, it is said that when some people listen they are rather like a pot upside down: however much water your pour onto it, not a drop will go inside. Is it not difficult for beginners to actually hear what is being taught? Actually this image does not only refer to beginners, it could fit anybody who is just sitting there and not concentrating on the words of the teacher, whether they are a beginner or not. That’s why I think it is important to teach in short sessions because it is difficult, especially for modern people, to concentrate during very long teaching sessions. So this point does not only apply to newcomers: whenever we receive teachings, it is crucial to concentrate on the words and on the meaning. Dilgo Khyentse Rinpoche said that “the more and more you listen, the more and more you hear, and the deeper and deeper your understanding becomes”. Could you say something about the process of deepening our understanding through going over the teachings again and again? First of all, by hearing teachings just once it is difficult to remember everything. Secondly, even if you do remember them, you must be able to apply them in your daily life, and for this to happen you must have a very strong inner understanding which is only obtained through hearing again and again. In my own case, for example, even though I have received many teachings and have read the same books a hundred times, each time I read them I understand something more. As your wisdom grows you touch another level of understanding of the same teachings. It is rather like hearing the same teaching as a baby, then as a teenager, and then as an adult: as you grow older, your understanding evolves. It is not easy to say in words exactly how this happens, but there is no doubt that by hearing again and again, and by contemplating and meditating, our understanding does deepen. Can you explain the relationship between knowledge and wisdom? Let’s consider knowledge first. By knowledge we mean intellectual understanding. Some university professors, for example, may have considerable knowledge of the Dharma, but they might not have true wisdom in the sense that they don’t practise it or believe in it but simply study Dharma as part of an academic training. Of course only certain scholars fall into this category, not all. Wisdom, on the other hand, is practised: it is applying whatever knowledge you have gained to your daily life. For example, friends in the West have told me that before they became Buddhists they had no hesitation in swatting cockroaches or mosquitoes, but after hearing the teachings they stopped. This is a very small thing, just one example among many, but it illustrates the way to practise. After hearing the teachings, you slowly change your lifestyle. Even though you cannot practise the Dharma twenty-four hours a day or change everything overnight, yet slowly, in small ways, you change. The main point is that through practising like this, you gain that inner wisdom. So wisdom is gained through personal experience of the truth of the teachings in life. How is contemplation actually practised in Buddhism? We examine the basic Buddhist views that I mentioned earlier, considering how true they are in our own life, in our surroundings, and in the world. We usually take one or other point and focus on that over a twenty-four hour time period. After such a practice, you are convinced through your own analysis and observation that the teachings you heard were genuinely true. Is it a formal practice or is it practised in everyday life? It is practised more in everyday life. For contemplation, you do not have to sit in formal sessions. You relate the teaching to whatever you are doing, or whatever you meet in life. This is how to integrate the teaching into your life. It is for meditation that we sit in formal sessions. In practice, do we train in the Three Wisdoms as a linear process, or is it more organic? This depends on the individual. Certain people need to go through a process one step at a time, whereas others who are very fortunate and have very positive karma gain a deeper understanding very quickly. As you know, we in the West feel it is important to express ourselves. In the learning process you describe, is it recommended to express one’s understanding and confusions at each stage? It depends on the circumstances. I think it is good for the disciple to express whatever knowledge he or she has come to, whether through hearing, contemplation or meditation, to the teacher so that the teacher may adjust or correct it if necessary. But if you express it to other people, many different emotions can become involved: like pride, for example, when you think you know better than the other person. Therefore, until you have a deeper understanding, it is wiser not to express it to others unless you are completely certain you have understood things well. In Tantra we talk about clarity and wisdom as two different aspects of mind. What is the relationship between the two? Wisdom in this context is the particular wisdom obtained through meditation, whereby you directly see, or at least have a general understanding of, ultimate reality. When you attain this ultimate view, you cannot say that these aspects are either separate, or one and the same; ultimate wisdom is beyond description, beyond words, beyond any attempt to say it exists or does not exist. It is void, yet not completely void. Voidness would imply total nihilism and this is not the case because there is another aspect within its emptiness, a continuity of clarity. ‘Clarity’ implies something that exists, and ‘voidness’ implies something that is not there, yet although they seem contradictory, they are not. Just as you cannot separate fire from the heat of fire, in the same way you cannot separate clarity from the wisdom of emptiness, nor emptiness from clarity. Wisdom and clarity are neither one nor two: this is the ultimate state. Would you like to add a final point? I think it is very encouraging to see that so many people in modern society are interested in spirituality, and in particular in the Buddhadharma. I believe the Buddhadharma is the source of all happiness and benefit. If we practise it according to the teachings, we could have real happiness in this life, bring happiness to others and have happiness in future lives. But I also think it is very important not to dilute Buddhism. Nowadays there is a tendency to slightly dilute the teachings, and modify them a little here and there, according to the individual and social needs of the times. I do not think this is right. It is very important to keep the teachings pure. This wisdom was given to us by the fully enlightened Buddha, and it was then passed down from one master to another; it is a very different form of knowledge to ordinary knowledge, and very sacred. As ordinary beings full of defilements, we are not in a position to change the teachings, so we must maintain the traditional way of practising and respect its value.